Pilates Open Studio is an excellent opportunity for experienced students to develop a personal practice by performing the work without depending on an instructor for corrections. Privé Swiss Fitness offers specific Open Studio hours that are supervised by our staff of certified Pilates instructors who are readily available to answer questions or provide spotting during advanced exercises. Our signature workout – You won’t find this class anywhere else! Define your physique and burn serious calories using resistance bands hanging from the ceiling to stretch, sweat, strengthen and slenderize your entire body. 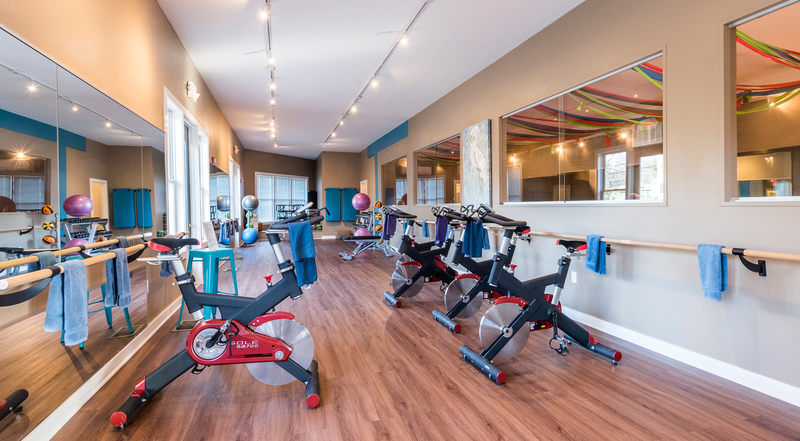 The dynamic combination of principles of pilates, resistance training, barre and barefoot cardio will leave you feeling lighter, stronger and full of energy. This fast paced, fast moving, comprehensive total body workout focuses on upper/lower body exercises and core movements that provide both cardio and strength. Within the 60 minute workout, participants experience short intervals that deliver a calorie drenching workout and post metabolic boost (ie. boosts your metabolism to burn calories after the workout). Body weight, free weight, ceiling bands, disks and the pilates ball make the movements fun and never boring! Expect to move in this class! Please wear sneakers! Modifications for all levels! We’ve taken the best of two worlds and created a fun and effective class! This total body workout incorporates the cardio of the rebounder trampoline and the strength training of our trademarked Barefoot Bands to give you a fun, calorie burning, energizing workout! An exhilarating, free style dance based cardio class led by Body Jam Master Trainer Becky Forbes! Whether you’re a lifetime dancer or have two left feet, just let yourself go and lose yourself in the music! The classical mat repertoire with variety and ample modifications to suit students of all levels. We use stability balls, the Pilates power circle, foam rollers and resistance bands to challenge and assist students on their path to discovering their deepest powerhouse muscles! Embrace your inner child with a total body trampoline workout that’s easy on your joints, provides quick visible results, blasts calories and is fun for all ages and fitness levels! 60 minutes of combined cardio, core work and light weight training utilizing resistance bands and weights, this class will transform your body! An excellent compliment to Pilates, barre and yoga! Appropriate for all ages and fitness levels. This is not your typical yoga class! An invigorating, heart-pumping, cardio-based yoga workout set to high energy music. Combine power, control and endurance based training with the balance and flexibility components in yoga. This class omits the need for any equipment and will improve your strength, flexibility and fat-burning power in a low impact format that is safe for all levels. This no nonsense, results oriented fitness method is tough but safe while building flexibility and strength equally. Barre is a body shaping workout combining strength training, orthopedic back exercises, dance and hatha yoga all wrapped into an hour of mind-body exercises to leave you feeling simply amazing. Sticky socks are strongly recommended. This class combines the resistance and balance workout of the Pilates Chair with the Spinal and Corrective Movements of the Pilates Barrel to create a full body workout focusing on engaging and moving from the core. This class will have you feeling strong, lengthened and toned all while focusing on stability and your powerhouse! Pilates Mat is a series of floor exercises designed by Joseph Pilates that focus on breath, concentration, control, centering and precision. These exercises are designed to uniformly strengthen the body as a whole creating a balance of strength and flexibility. A full body strength and cardio workout all in one session! Ride through hills and sprints, then immediately head to the mat for a body weight/free weight/resistance bands and core training circuit. You’ll alternate and before you know it – you’re done! Connect mind and body, while slowing down and releasing tension. This yoga class provides a soothing sequence to promote flexibility, create calm in the mind and restore balance and harmony in a mindful practice of breath, gentle movement and meditation. This yoga class is for all levels to enjoy. The Pilates Chair is a small piece of equipment with a padded seat and springs designed to give a total body workout with emphasis on lower and upper body. In this group class clients can expect to be challenged to increase strength and find improvement in conditioning by practicing classical Pilates movements while standing, sitting, climbing, pushing and lifting as well as balance exercises. We will focus on core, upper body strength as well as shoulder stability, mobility and functional movements. Think big workout on small equipment! All levels welcome! Previous pilates equipment experience required. Experience the benefits of the classic apparatus – reformer, tower, chair and barrel! Learn how the unique qualities of each piece serves its own special purpose in your pilates practice. All students are required to attend a minimum of one private lesson prior to attending group equipment classes. A great place for people who are new to the studio to start and an excellent refresher for experienced students to revisit. This class is designed to teach you how to use the equipment safely, as well as master the important principles of pilates. All levels welcome but focus is on basic, beginner-level instruction with a toned down pace. Expect an intense, form-focused and safely instructed experience! The class incorporates all the key principles of Pilates such as postural alignment, breathing, core stability, controlled movement and flexibility. It is low-impact and done on the floor. The mat floor exercises are also combined with other props such as weights, balls, therabands, rings, and Barre. The instructor gives participants hands-on attention and makes appropriate modifications for each student’s ability. Classic pilates mat work combined with active stretching & foam rolling to release tight muscles, relieve stress and help you remain injury free! All levels encouraged. The Reformer is a sophisticated system of springs, straps, pulleys and a rolling platform. Joseph Pilates called it the Reformer because it “reforms the body back to the way it’s intended to move”. It works in two ways: It provides resistance to build strong muscles and bones, and it can act as an additional muscle to aid the body on its path to health while you work towards efficient movement patterns with assistance. This class may also include work on the Tower which works to correct imbalances in the body and to stretch and tone muscles.Open to all levels. New clients must first be cleared by on of our certified teachers before attending group classes. This is required for safety reasons. Unlike mat and reformer, the pilates tower doesn’t offer a set classical order. The majority of tower exercises focus on one area of the body at a time, making it easier to isolate muscle groups. Expect variations and quick advancement using springs to sculpt and strengthen every major muscle group in the body! ZUMBA® is a fusion of Latin and International music / dance themes that create a dynamic, exciting, and based on the principle that a workout should be “FUN AND EASY TO DO.” The routines feature aerobic/fitness interval training with a combination of fast and slow rhythms that tone and sculpt the body.